Prisha India Craft are engaged in offering an exquisite variety of Ghungroo Belts. Ghungroos, a musical anklet used by performers of all classical dances. 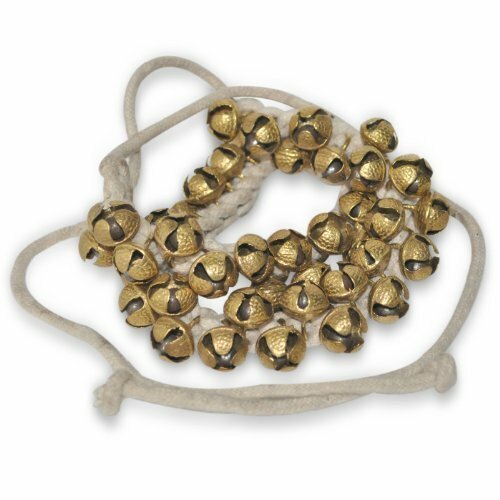 Number of bells are attached to a string or tied to a cotton cord, velvet pad strap to form a ghungroo. These bells are made of brass and have small iron balls inside which add quite a lot of weight to them. The bells are decorative in themselves and the cords strung are often bright and finished with tassels.The sounds produced by Ghungroos vary greatly in pitch depending on their metallic composition and size. We have many different types of ankle bells for various dance forms. The Ghungroos on rope are used mainly for Kathak dance. Ghungroo pair made in brass mounted on colourful cloth/velvet pads/Cotton pad are mainly used for Bharatanatyam, Kuchipudi and Odissi dance. Depending upon the age of the dancer and the size of ankles, one can choose the size of the ankle bell. Usually adults prefer a 5 line or 4 line ankle bell. DECLARATION - Buy ORIGINAL products with "Prisha India Craft - LOGO" from seller "Prisha India Craft". Be aware of fake products from other sellers. Customer Satisfaction is our primary goal. SPECIALLY DESIGNED PROFESSIONAL GHUNGROO.